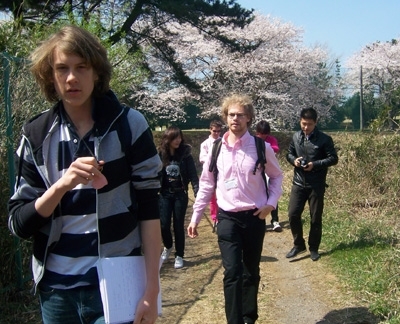 As you know, in every city on the World Campus — Japan tour, we have a city theme. The theme for Abiko city was the environment. This is an issue that I feel very strong about but the topic is also quite broad. When thinking about the environment you can talk about nature itself, but also the animals in nature on a more local level. But the environment can also be discussed on a more global level too; which today more or less means the discussion about global warming and the future that lies ahead of us. A discussion involving the life we want to leave for future generations and the ethics and morals around it. With all these levels in this theme in mind, Abiko City and World Campus — Japan chose to focus on a few of them. It all started in Uda City, with the group watching the movie “An Inconvenient Truth”. A film portraying the problems of global warming and why global warming is an important issue. The creator of the film, Al Gore, discusses his personal story connected to the environment and global warming and why he became interested. The movie also shows important facts about global warming and proves that it is an important issue that should be dealt with. The movie has been criticised for better and for worse all over the world and there are some facts that are not scientifically proven. But the message is agreed upon in the scientific world and a discussion has started on higher levels, around the world. Our stay in Abiko contained visiting a bird and water museum but we also explored nature around Teganuma lake. We even had a speaker at the community music event talk about global warming and the responsibilities of the richer countries in the world to take actions. An interesting point he made is the definition of a developed country. Is a developed country definition only based on economy or can the environment have a bigger say here? If we take the environment in consideration then very few countries are really developed. By visiting the bird and water museum we had the opportunity to visit the nature around us and how human activity affects the environment we share and love. Also in the water museum we learned how they cleaned the water from pollution as this lake that was the dirtiest in Japan for 27 years. Though they suddenly changed their mindset and began a cleaning process making the lake cleaner and more beautiful. I also had the opportunity to present my passion to the group as a follow up on the movie we saw the week before. As a continuation on “An Inconvenient Truth” which portrays the problems more than the solutions, I therefore decided to make a PowerPoint on what you can actually do and the difference it makes. I tried to focus on the solutions giving the most impact. Of course recycling, less waste and less consuming and energy use was at the top. But also things like eating less meat and changing your way of transportation makes a bigger impact using little tools. The most important thing in my opinion is to see the connections for example that what you do has an influence on your surrounding. Chemicals as an example will never be reduced if we do not start to use less of them and reducing their quantity in the environment. But also informing others and creating awareness about the problem is 50 % of the job since alone we are limited but together we can change, as cliché it may sound it is still true. But if you want to make changes then make changes you are comfortable with in order to make a long-time commitment and change. A great week with many sources of information and activities, it was a wonderful conclusion on our amazing stay in Japan with a great foundation in becoming World Citizens.